On March 9 the U.S. Air Force held a ceremony to officially bring the service’s operational employment of the pioneering General Atomics RQ/MQ-1 Predator to a close. The event took place at Creech AFB, Nevada, the base near Las Vegas that is the center of U.S. Air Force RPA (remotely piloted aircraft) operations and training. During the ceremony a single MQ-1B performed the last local flight, operated by a crew from the 489th Attack Squadron, part of the 432nd Wing that is the parent unit at Creech. 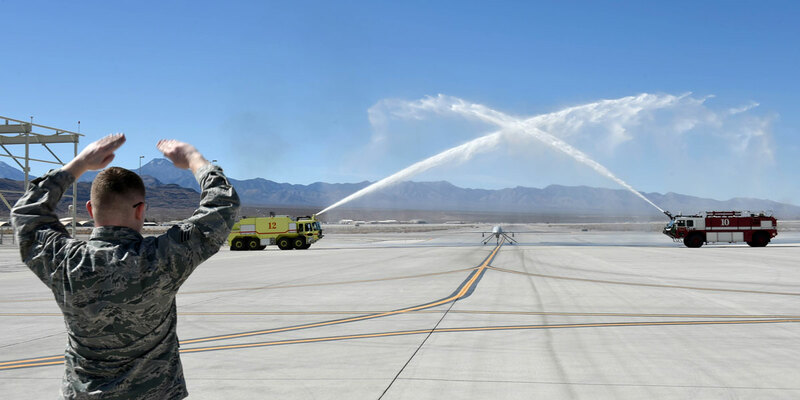 On its return the Predator received a traditional water salute from the base’s fire crews. At the same time, a 15th Expeditionary Attack Squadron crew controlled the final operational sortie via satellite link, the air vehicle itself flying in an undisclosed area of responsibility. A gathering of Predator alumni was addressed by speakers with close connections to the program, including Baghdad-born Abraham Karem, who was the chief architect of the Predator. Karem had built his first RPA—﻿the Albatross—in his garage, and from it had developed a series of air vehicles such as the Amber and Gnat through his company Leading Systems Inc. LSI was subsequently acquired by General Atomics, but Karem and his team remained to oversee development of what became the Predator. First flying in January 1994, the Predator was deployed operationally for the first time in 1995, to Albania for operations over former Yugoslavia. The same year the Air Force's first Predator unit, the 11th Reconnaissance Squadron, was established at Indian Springs Air Force Auxiliary Field (renamed Creech AFB in June 2005). The Predator was initially designated RQ-1, but became the MQ-1 to reflect a multi-role mission as increasing numbers of sorties were flown in armed configuration with the AGM-114 Hellfire missile. RQ-1s were among the assets deployed for operations over Afghanistan in 2001 and remained the backbone of in-theater U.S. RPA operations until supplanted by the MQ-9 Reaper/Predator B. In 2011 General Atomics delivered the last of 268 Predators to the Air Force, at a time when the fleet was nearing a million flight hours. From that time the Air Force active inventory began to dwindle, and was down to just over 100 air vehicles by the start of this year. Replacing the Predator as the RPA workhorse is the General Atomics MQ-9 Reaper, a heavier and more capable derivative of the Predator known to its manufacturer as the Predator B. The U.S. Air Force plans to acquire 346 Reapers, and Predator crews are being re-trained for the MQ-9. The conversion process is scheduled to be complete by the end of 2018. In the meantime, the Predator shape will fly on for many years in the form of the MQ-1C Gray Eagle version operated by the U.S. Army, and export versions of the RQ/MQ-1. Italy has flown Predators on many operations, including deployments to Djibouti to assist anti-piracy operations, while the UAE has bought the Predator XP, an export-dedicated unarmed version with winglets.